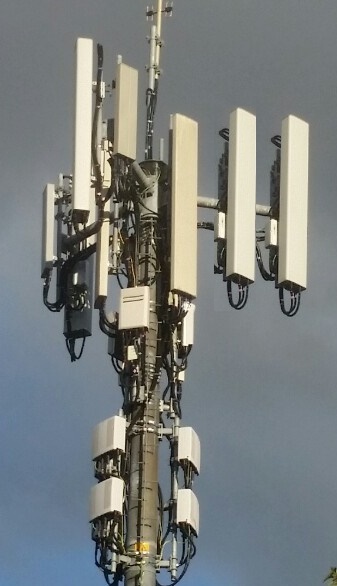 In array antennas, beamforming, also known as spatial filtering, is a signal processing technique used to transmit or receive radio or sound waves in a directional signal. Beamforming applications are found in radar and sonar systems, wireless communications, and in acoustics and biomedicine equipment. Beamforming and beam scanning are generally accomplished by phasing the feed to each element of an array so that signals received or transmitted from all elements will be in phase in a particular direction. When transmitting, a beamformer controls the phase and relative amplitude of the signal at each transmitter thus creating a pattern of constructive and destructive interference in the wavefront. When receiving, sensors are combined in a way where the expected pattern of radiation is preferentially received. Beamforming techniques direct the beam radiation pattern in the desired direction with a fixed response. Array beams can be formed or scanned using either phase shift or time delay systems. In narrowband systems, a time delay is known as a phase shift. Beamforming by phase shifting can be accomplished using ferrite phase shifters at RF or IF. Phase shifting can also be done in digital signal processing at baseband. Systems using time delays are preferred for broadband operation because the direction of the main beam does not change with frequency. Time delays are introduced by varying the lengths of transmission lines. As with phase shifting, time delays can be introduced at RF or IF and works well over a broadband, but the bandwidth of a time scanning array is limited by the bandwidth and spacing of the elements. As the frequency of operation is increased, the electrical spacing between the elements increases so that the beams will be somewhat narrower at higher frequencies and, as the frequency is increased further, grating lobes appear. In a phased array, grating lobes are induced when the direction of the beamform extends beyond the maxima of the main beam and the main beam reappears on the wrong side. Elements must be spaced properly in order to avoid grating lobes. The weight vector is a vector of complex weights where the amplitude components control the sidelobe level and main beam width and phase components control the angle of the main beam and nulls. Phase weights for narrowband arrays are applied by a phase shifter. Antennas that are designed to adapt and change their radiation pattern in order to adjust to the RF environment are called active phased array antennas. Examples of beamform designs include the Butler Matrix, the Blass Matrix, and the Wullenweber Array. The Butler matrix uses a combination of 90° hybrids and phase shifters and can cover a sector of up to 360° depending on element design and patterns. Each beam can be used by a dedicated or single transmitter or receiver controlled by an RF switch. Thus controlled, a Butler matrix can be used to steer the beam of a circular array. In broadband operations, the Blass matrix uses transmission lines and directional couplers to form beams by using time delays. A Blass matrix can be designed for use as a broadside beam but can be lossy because of the resistive terminations. A Wullenweber array is a circular array designed for direction-finding at HF frequencies. This array uses Omni-directional elements or directional elements usually designed with 30 to 100 elements, a third of which are used sequentially dedicated to form a high directional beam. A goniometer is used to connect the elements to the radio with amplitude weighting to control the array pattern and has the ability to scan over 360° with little deviation in pattern characteristics. Time delays are used to form beams radial to the array, enabling broadband operation.